“Commuter Rail is Commuter Rail. It’s not transit. It’s designed to bring people into the city in the morning and take them home at night.” That statement, made not long ago by a former MBTA General Manager, reflects a mid-20th century view of intercity rail. It is not a vision that responds to today’s realities or the future, nor is it a business model that makes sense. It shortchanges the potential of our rail network and reinforces the system’s current emphasis on providing service only to a privileged niche of society. Instead of solely using Commuter Rail to serve 9-to-5 suburban commuters, the MBTA should be employing every available tool to improve public transportation in the region. With traffic congestion worsening with each passing month, the need for fast, flexible, and affordable mobility alternatives is more apparent than ever. Regional Rail promises passengers freedom of access by transit from wherever they are to wherever they are going across the region. With train service at frequent intervals, passengers won’t be burdened by multi-hour waits. Regional Rail makes strategic investments in infrastructure and equipment to provide the best possible schedule. We expect many suburban residents will be attracted to a more schedule-friendly service and will choose to rely on Regional Rail, reducing automobile dependence throughout the region, with an associated positive impact on roadway congestion and vehicular emissions. Regional Rail is therefore about extending freedom from car dependence to a greater portion of Metropolitan Boston. It is also about opening up opportunities in the Gateway Cities—older urban centers that will find it easier to attract jobs and development if linked to the urban core by a more reliable, speedy, and convenient intercity rail system. This vision and business model gives passengers throughout the region access to good public transportation all day, connecting cities in the eastern third of Massachusetts to one another. MBTA Commuter Rail operates on eight high-quality rights-of-way entering Downtown Boston from the north, west and south, connecting to the suburbs and to neighboring cities like Providence and Worcester. It is imperative that the MBTA maximize their utility to support a 21st century Regional Rail system. The basic elements of the Regional Rail vision and business model are summarized on the following pages. The fastest regional train in America would still not be useful if it didn’t come when people wanted to ride it. A successful business model employs strategies to attract more customers. So too, our intercity rail system cannot expect to grow ridership (a modal shift goal we assume is a top priority for state policymakers) without offering a service that responds to the mobility needs of those riders. Public transit must be frequent all day, not just at rush hour. Commuter Rail is stuck in a “chicken-and-egg” dilemma today: trains running every two hours off-peak are not reliable enough for people to choose to depend on them, so people drive when they might otherwise use transit. Regional Rail solves this dilemma. Trains would run at least every half hour all day in the suburbs and at least every fifteen minutes in Boston and surrounding suburbs like Newton, Waltham, and Lynn. destination by bus or subway, on one fare. Prices listed are based off a one-way trip originating at South Station. zone fare structure systemwide remains. Subways—designed to provide frequent service throughout the day—are powered by electricity. They also allow level boarding (step-free access) from the platform to the train. To transform Commuter Rail into a modern Regional Rail network, the Commonwealth must invest to equip the system with both of these features. Electrification makes the trains cleaner and quieter; self-powered electric trains, called electric multiple units (EMUs), also accelerate much faster than diesel locomotives and are significantly more reliable than current equipment. Level boarding and wider doors provide ADA-compliant access for wheelchair users and also let able-bodied passengers board faster, reducing the amount of time a train has to dwell at each station. We estimate that on most lines, electrification and level boarding can cut travel time by 40%. The Batty Family launched a campaign supported by the Spina Bifida Association and worked closely with the MBTA, FTA and local officials to secure the funding needed to make Wedgemere an accessible station. Ultimately they were successful when in 2013, Wedgemere reopened after renovations as a fully accessible station. 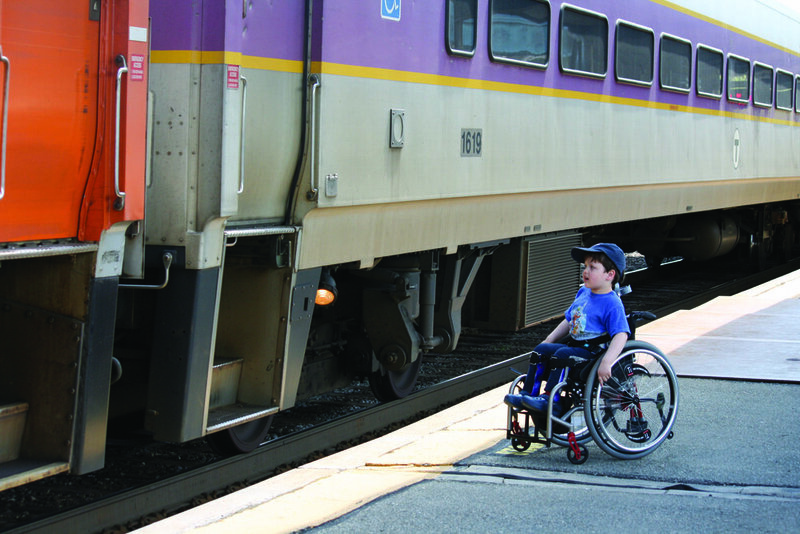 Large portions of the MBTA Commuter Rail network are not ADA-compliant, restricting access to people with disabilities. Expansion of rail service can expand opportunity and strengthen ties to our Gateway Cities. Regional Rail holds special promise for the wide variety of lower-income communities across the Boston region, which are often rich in underutilized rail infrastructure, a legacy of their industrial past. Unfortunately, as Commuter Rail has come to emphasize fast suburb-to-core commutes at the expense of all other trips, many stations in dense, walkable areas have been abandoned or moved to inaccessible “park and ride” locations. Regional Rail would move stations back to town centers, walkable to working-class residents—precisely the sort of strategy that grows ridership and improves access to jobs. A complete Regional Rail vision and system will one day include intercity rail to Springfield, enhancing regional equity and enabling another route to New York City. Lower-income urban neighborhoods are underserved as well, and residents must endure long commutes by bus. Regional Rail can bring new stations to underserved areas. The ongoing project to add infill stops on the Fairmount Line is a good model. TransitMatters’ vision of Regional Rail includes additional stops in walkable locations, many of which are located in low (or lower) income communities. With EMUs and level boarding, a future Regional Rail system could make these extra stops without losing time.